This article is about the film. For the soundtrack, see Small Soldiers (soundtrack). For the video game, see Small Soldiers (video game). Small Soldiers is a 1998 American science fiction war comedy film directed by Joe Dante and starring Kirsten Dunst and Gregory Smith. It revolves around a conflict between two factions of action figures powered by military technology, the Gorgonites and the title characters, Commando Elite. When an adolescent (Smith) brings the Gorgonites to his home, he and those around him become targeted by the Commando Elite, who are programmed to eliminate the Gorgonites and their allies. Frank Langella and Tommy Lee Jones co-star as the voices of the leaders of the Gorgonites and the Commando Elite, respectively. The film received mixed reviews from critics and grossed $71.1 million on a $40 million budget. It was also the last major film role of Phil Hartman and is dedicated in his memory. Top defense contractor GloboTech Industries acquires the Heartland Toy Company and as part of the move, Globotech CEO Gil Mars tells Heartland toy designers Larry Benson and Irwin Wayfair to develop actual live action toys capable of "playing back". Mars selects Larry's soldiers, the Commando Elite, for the project and Irwin's creatures, the Gorgonites, for their enemies, with the toy line expected to hit the market in three months. Faced with such a tight deadline, Benson forgoes safety testing, then uses Irwin's password and chooses GloboTech's X1000 microprocessor to activate the toys. Teenager Alan Abernathy signs off for a shipment of the toys at his family's toy store without his father's consent. He and delivery driver Joe activate the leaders for each group – Archer for the Gorgonites and Chip Hazard for the Commando Elite. Alan's neighbor and love interest, Christy Fimple, buys Chip Hazard as a birthday present for her brother, Timmy. Alan returns home to discover Archer in his backpack; he realizes Archer is sentient, but in the meantime, the Commando Elite awaken and attack the Gorgonites in the toy store. Alan calls the company and files a complaint. Later, when Larry and Irwin listen to Alan's voice mail, Irwin is terrified to discover the X1000 was designed for smart munitions guidance; a Globotech engineer reveals the artificial intelligence circuit is designed to learn over time, but mass production was scrapped due to issues with electromagnetic pulse shielding. Meanwhile, Chip Hazard and his squad pursue Alan to his home and attempt to kill him and Archer in the kitchen. Alan is attacked by Commando Elite Nick Nitro, whom he mortally wounds. His parents, Stuart and Irene, arrive at the kitchen, having been alerted by the sounds of the scuffle there. Alan attempts to explain what is going on, but with Archer not supporting his explanation, neither of his parents believe him. The next day, Alan and Archer find the rest of the Gorgonites in a dumpster at the store. At home, Alan learns that the primary goal of the Gorgonites is to seek their homeland Gorgon, which they mistakenly believe to be in Yosemite National Park. Through tapping the Abernathys' phone line, the Commando Elite learn of Alan's interest in Christy, immobilize the Fimples' household and take Christy hostage to force Alan into surrendering the Gorgonites. Alan and Archer sneak into the Fimples' house to save Christy, but run into her Gwendy dolls, whom the Commando Elite engineered as auxiliary troops. The Gwendys quickly subdue Alan. Archer cuts Christy loose from her bonds, and together, they save Alan and destroy the Gwendys before escaping. The Commando Elite pursue them in kit-bashed vehicles, but are seemingly destroyed in a crash. The two teenagers and Archer return to Alan's house, only to find both their families waiting for them, believing that Alan kidnapped Christy and immobilized the Fimples. This time, Stuart and Irene believe Alan and Christy's account of the Gorgonites and the Commando Elite, but Phil and Marion, Christy's parents, remain skeptical. Irwin and Larry arrive and talk to Alan about his voicemail. At that moment, Chip Hazard, the only survivor of the crash, attacks the house with a new force of Commando Elites from a hijacked recall shipment by Joe and with more improvised vehicles and weapons. A battle promptly breaks out between the Commando Elite, the Gorgonites, and the humans inside, resulting the house's electricity supply being cut off. Inspired by Irwin's advice to create an EMP blast, Alan heads out to force an overload of the power lines. Christy, Irwin, and Larry head to the Fimples' house to turn on all electronic items inside and wedge the power transformers open for a larger surge. At Archer's command, the Gorgonites emerge and fight back against the Commando Elite. Chip Hazard flies to the top of the power line pole to stop Alan, where he briefly battles and defeats Archer, but finds himself thrust by Alan into the power line, triggering the EMP blast, which destroys Chip Hazard along with all of the remaining Commando Elites. Mars arrives in his helicopter during the police and fire department cleanup the next day. He pays Joe, the Fimples, and the Abernathys for damages, as well as buying their silence from the media, and orders Larry and Irwin to prepare the Commando Elite for sale to rebels in South America. Among the craziness of the aftermath, Alan and Christy part on highly amicable terms, having agreed to start a relationship with each other. Alan later discovers that the Gorgonites have screened themselves from the EMP blast by hiding underneath the Fimples' large satellite dish. The Abernathys bring the Gorgonites to Yosemite National Park, where Alan sends them out in a large toy boat from his father's store to find their island home of Gorgon. Frank Langella as the voice of Archer: the noble cat-like leader of the Gorgonites. Tommy Lee Jones as the voice of Chip Hazard: the platoon leader of the Commando Elite. George Kennedy as the voice of Brick Bazooka: the Commando Elite's artillery expert. Jim Brown as the voice of Butch Meathook: the Commando Elite's sniper. Ernest Borgnine as the voice of Kip Killigan: the Commando Elite's covert operation expert. Clint Walker as the voice of Nick Nitro: the Commando Elite's demolition expert. Bruce Dern as the voice of Link Static: the Command communication expert. Christopher Guest as the voices of Slamfist and Scratch-It: Slamfist is the hunchback-like enforcer of the Gorgonites and Scratch-It is Punch-It's female frog-like sibling. Michael McKean as the voices of Insaniac and Troglokhan / Freakenstein: Insanic is the crazed Gorgonite and Troglokhan is Gorgonite's navigator who is rebuilt as Freakenstein after he is damaged by the Commando Elite. Harry Shearer as the voice of Punch-It: the brontothere-like Gorgonite. Jim Cummings as the voice of Ocula: the one-eyed insect-like scout of the Gorgonites. The Commando Elite, excluding Jones and Dern, are voiced by cast members from the The Dirty Dozen. Dern replaced Dirty Dozen actor Richard Jaeckel, who died before shooting began. Excluding Langella and Cummings, the Gorgonites are voiced by cast members from This Is Spinal Tap. Sarah Michelle Gellar and Christina Ricci provided the voices for the Gwendy dolls. Miller and Balaski previously appeared in Dante's films Piranha and The Howling, while the character of fellow Howling cast member Picardo, Ralph Quist, shares a surname with Eddie Quist, his character in that film. Small Soldiers was Hartman's last role in a major film before his death and the film is dedicated to his memory. On making the film, director Joe Dante recalled, "Originally I was told to make an edgy picture for teenagers, but when the sponsor tie-ins came in the new mandate was to soften it up as a kiddie movie. Too late, as it turned out, and there are elements of both approaches in there. Just before release it was purged of a lot of action and explosions." On the film's special effects, Dante stated, "We were planning to use a lot of Stan Winston's puppets—he had made some very elaborate puppets that could do a lot of things. But in practice, we found it was much simpler and cheaper to let the CGI people do the work after we'd shot the scenes. So, I would say, it's one-third puppetry and the rest CGI in Small Soldiers, even though the original idea was to do mostly puppetry." 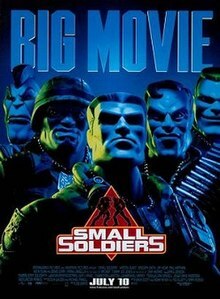 On Rotten Tomatoes, Small Soldiers has a rating of 48%, based on 44 reviews, with an average rating of 6.2/10. Audiences polled by CinemaScore gave the film an average grade of B+ on an A+ to F scale. A soundtrack containing classic rock blended with hip hop was released on July 7, 1998 by DreamWorks Records. It peaked at 103 on the Billboard 200. The film score was composed and conducted by veteran composer Jerry Goldsmith. In addition, an action-adventure video game based on the film was developed by DreamWorks Interactive and released by Electronic Arts on September 30, 1998. Kenner Products (a subsidiary of Hasbro) produced a line of toys, which featured the Gorgonites and the Commando Elite. Burger King teamed up with the film to promote their new product, the Rodeo Burger. They created a line of kids' meal toys tied to the film. They were met with some controversy after the film received a PG-13 rating from the Motion Picture Association of America. Burger King executives claimed this caught the company by surprise and they were led to believe the film would receive no higher than a PG rating. While the pamphlet accompanying the toys included the disclaimer "While toys are suitable for children of all ages, the movie Small Soldiers may contain material that is inappropriate for younger children," some restaurants accepted an exchange for Mr. Potato Head toys. ^ "Small Soldiers - Thoughts". ^ "Small Soldiers The Numbers Listing" (http://www.the-numbers.com/movie/Small-Soldiers#tab=summary). The Numbers. Accessed 5th January 2017. ^ Philpot, Robert (1998-12-06). "1998's top closing moments". Fort Worth Star-Telegram. p. Arts 1. ^ Brew, Simon (February 21, 2008). "The Den of Geek interview: Joe Dante". The Den of Geek. Retrieved January 9, 2016. ^ Sachs, Ben (August 8, 2012). "The orgiast: an interview with Joe Dante (part one)". Chicago Reader. Retrieved January 9, 2016. ^ Neville, Ken. ""Small Soldiers," Big Controversy". E Online. Retrieved 12 May 2015.